Back in the day I loved the “green sauce” they made in Spanish restaurants. Here is my take on a night in Spain. Place the green sauce ingredients in the food processor and process well. Taste and adjust seasonings. Heat up grill pan. Cut the tofu into triangles and brush with the marinade. Place that side down on the grill pan and cook until you see grill marks. Then flip over and cook til done on the second side. Heat up extra sauce in a little pot. Preheat oven to 400. Slice the potatoes in halves or quarters depending on the size. Toss with paprika, salt, and olive oil. Roast for 40 to 45 minutes. Slice the onions into semi circles. Sauté in olive oil, salt and pepper until translucent. Slice the zucchinis into semi circles, add to onions and cook until done. 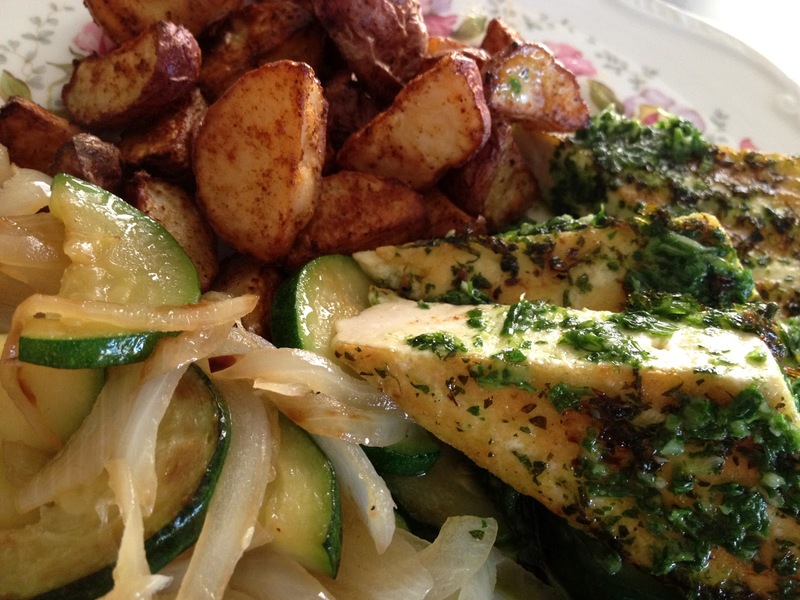 Plate up the tofu, potatoes and zucchini saute with extra sauce on top. Enjoy!